"This is my baby girl Daisy. She is half Schipperke and half Shih Tzu. Her dad is a registered Shih Tzu and her mom a Schipperke. She has a Shih Tzu face and ears and a white marking from a Shih Tzu on her chest. She is mostly black like a Schipperke, though. 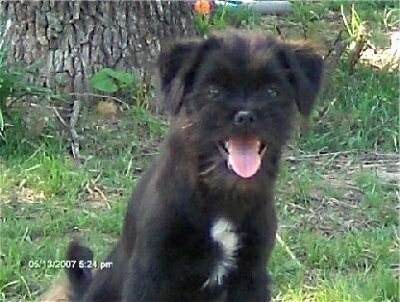 She was born in a litter of 8 that all are black with some very distinctive Shih Tzu markings. These puppies are very loving and loyal. They are also very hyper. Some of the puppies have the coarse, brittle hair like a Schipperke and some have the soft hair like a Shih Tzu, but none of them have really long hair like the Shih Tzu, which makes them a lot easier to take care of and they don't need all the grooming that our Shih Tzu requires. Daisy has a very soft coat like her dad, but it has stayed fairly short which makes her look as if she has just recently been to the groomer all of the time. All of the puppies have a very good disposition, but are all extremely hyper and love being around people. They get along great with other dogs and cats and are very much people-puppies and love attention." The Skip-Shzu is not a purebred dog. It is a cross between the Schipperke and the Shih Tzu. The best way to determine the temperament of a mixed breed is to look up all breeds in the cross and know you can get any combination of any of the characteristics found in either breed. Not all of these designer hybrid dogs being bred are 50% purebred to 50% purebred. It is very common for breeders to breed multi-generation crosses.